Columbia Overhead Trolley With Hammerhead Design Solves Burial Vault Handling Problems - Allied Power Products, Inc.
Why APPI: Finding a way to get burial vaults weighing up to 4,000 lbs. on and off Bicke’s flatbed delivery truck was complicated by the fact there was no auxiliary power on the truck. Although it was equipped with an I-beam crane rail supported by stanchions at the front and rear of the bed the limited head room and lack of power precluded using a typical hoist and overhead trolley. Our solution was a one-ton capacity 12 VDC hoist used in conjunction with one of our Columbia “Hammerhead” style overhead trolleys. The hoist was deck mounted next to the back of the cab and directly under the crane I-Beam. The wire rope is reeved from the hoist up through a vertical lead sheave under the beam and then through the overhead trolley sheaves and hook to the anchor point at the outboard end of the I-Beam. This arrangement allows the vaults to be lifted until they clear the top of the truck bed and then moved down the I-Beam to their transport position while remaining at a constant height off the deck. As the line pull at the hook is doubled by using one of our hammerhead trolleys, Bickes was able to use a 12 VDC hoist that did not overload the electrical system on their truck. Our Columbia Hammerhead trolleys are available in standard capacities of 1, 3, 7.5 and 10 tons. 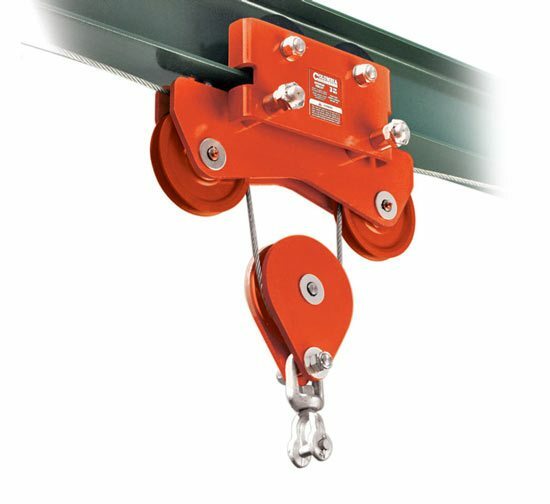 Manual positioning is standard but chain driven and powered options are available for indoor or outdoor use. Please contact us if you would like more information about this particular overhead trolley system or any of our other products and services.